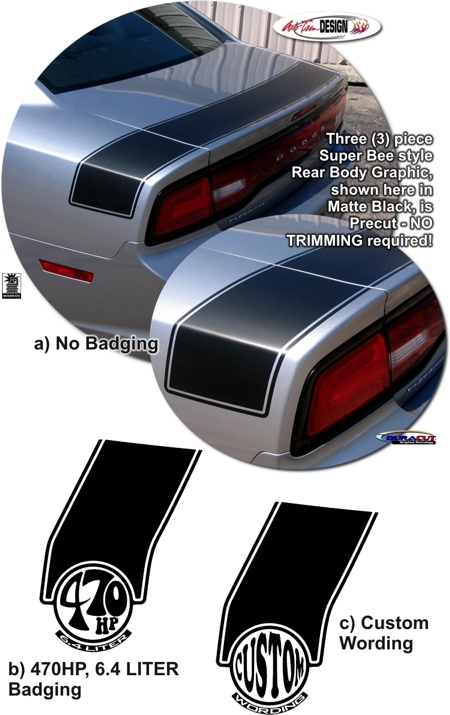 "Toughen-up" your '11-'14 Dodge Charger with this retro "Super Bee" stylized graphic kit. Available in a wide variety of colors, this three (3) piece kit is packaged with precut and contoured graphics for the Rear Lid Top and Rear Fender areas - NO TRIMMING required! Choose from a graphic with No Badging; 470HP, 6.4 LITER badging; or customize it as shown with unique wording. Simply enter the Custom Wording of your choice (up to sixteen  combined letters/digits/spaces) and we'll make it happen. Overall stripe width is approximately 8" (20.32cm) and features a classic pinstripe at each side as shown. For Dodge Charger models with Spoiler, temporary removal and replacement is required after successful application of Rear Lid piece.